Situation: A factory has many projects to do. Some are the industrialization of new products that they can be produced effectively. Some are improvement projects for speed, capacity, quality, cost reduction, capacity expansions. For the moment assume that the factory/company decides correctly which product development projects should be pursued (for instance with the 6 technology questions, AND improvement projects are also selected correctly with proper application of T, I, OE and proper focus on the organization’s constraint. There is still a big difficulty … conflict! Improvement projects show their returns quickly and many are measurable. They also protect current Throughput. Product development projects are a bet on future sales (even with application of the 6 questions AND whatever the new product will bring, that Throughput will start small – expenses often exceed Throughput initially). There is also the question of cannibalization of old products by the new ones. This is a good exercise for conflict resolution … BUT the assumptions, especially those about the new products, are about the future … uncertain. So, how would you solve this? The first issue to look at would be to identify the conflict. Even though the story speaks about two types of projects – new product development/industrialization projects and improvement projects – it is clear that there is no direct conflict between them. There cannot be a conflict on resource capacity – as project resources are clearly different, except, maybe, for the financial people who will be doing financial calculations, and a high level manager who needs to make the evaluation and decision for which project to go. There might be a feeling that the two types of projects are in conflict because of the contrast between the much higher certainty of the financial outcome and much shorter period until getting the benefit of improvement projects as compared to the product development projects. However, this is not a conflict, but a mere contrast. Since it has been mentioned that the company knows how to choose the right product development projects, it looks like the issue is the dilemma – to go extensively and actively for new product development/to keep on consistently investing in the product development or to keep on exploiting the current products that are probably well established and cannot be just upgraded (hence, the fear of cannibalization of existing products by new products). Also, what adds to the dilemma – is the fact that the company is apparently not in the business where they have to bring in new products all the time, just to keep being a player in their market – like, for instance, producers of mobile phones or High Street fashion brands. However, the company knows that in the long term they have to bring to the market new products to stay in market. 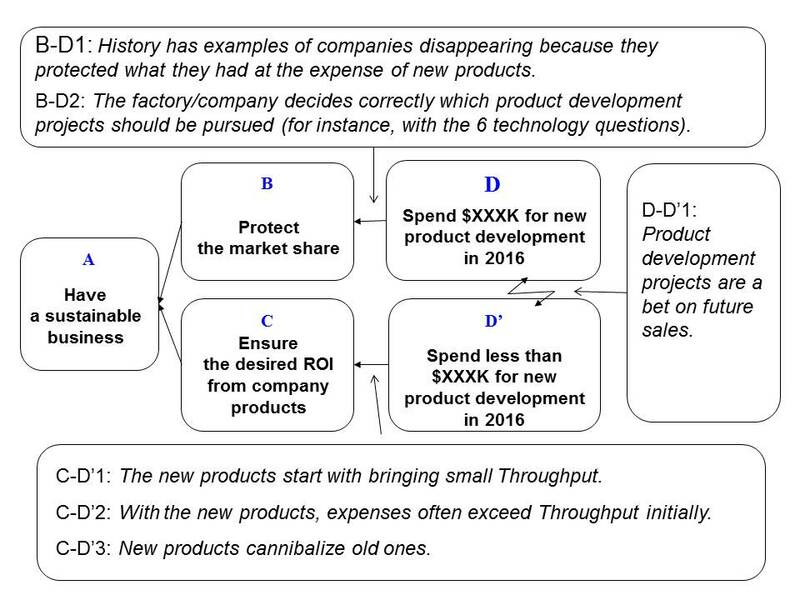 The fact that the riddle mentions the examples of the companies that disappeared because of neglecting the required scope of new product development says that the company keeps in mind these examples as a negative branch of NOT doing enough of product development. So, the described situation represents the dilemma NOT regarding ‘do/focus on the product development” vs “do not do/focus on the product development’, but regarding the scope of efforts and money to put in the product development. 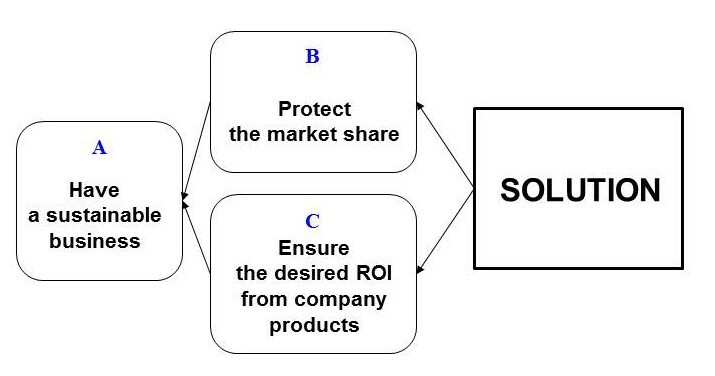 The need in B is derived from the statement in the riddle: History has examples of companies disappearing because they protected what they have at the expense of new products …. even though engineering had developments underway. I disagree that the assumptions about the new products and the future are uncertain. I agree that the assumptions will be speaking about uncertainty, but assumptions themselves are quite clear, and some of them are presented in the description of the company situation. I copied them into the Cloud below (in Italic). The solution to this Cloud should meet both B and C.
To find the solution – the assumptions should be challenged to find the way to negate them. If there are other assumptions behind the arrows in the cloud above, and if they are not in the ‘banana’ with the recorded ones, then not discovering and not addressing them will result in failing to break the cloud. Take logistical actions that will ensure that the supply chain will not have excess of old products not to incur financial damage of losing their sales. Develop a new product for a different price segment. Prepare a new product but wait with launching it until the supply chain has flushed the existing products. Launch new products gradually in different markets – according to how full is the relative supply chain with the existing products. Some thoughts regarding the assumption B-D2: The factory/company decides correctly which product development projects should be pursued (for instance, with the 6 technology questions). Actually this assumption “The factory/company decides correctly which product development projects should be pursued” contradicts the assumption behind D-D’ “Product development projects are a bet on future sales”: one either knows correctly, or bets. The assumption “Product development projects are a bet on the future sales” in itself challenges the assumption that the company correctly decides on which products to develop. “Correct“ decision would mean that the company does not make mistakes in predicting the finacial behaviour of the new product and has all new products perform according to the expectations. Is this really so? “Just one big BUT!! There is a resource conflict. The process engineers in the factories are responsible for both types of projects. New products require new/modified processes. Existing products require improvements – speed, quality, capacity, cost … and also require process engineers. YES, there are product development resources and they are a different set. The conflict arises when the new product is qualified for sale and must be industrialized in the factory. It is in the factory where the conflict occurs. This comment brings in new understanding of the conflict which is now truly between the product development projects and improvement projects. The continuation of the discussion will require pictures of more clouds, which is not handy to put in the comments. I will shortly write my thoughts in a sequel post.